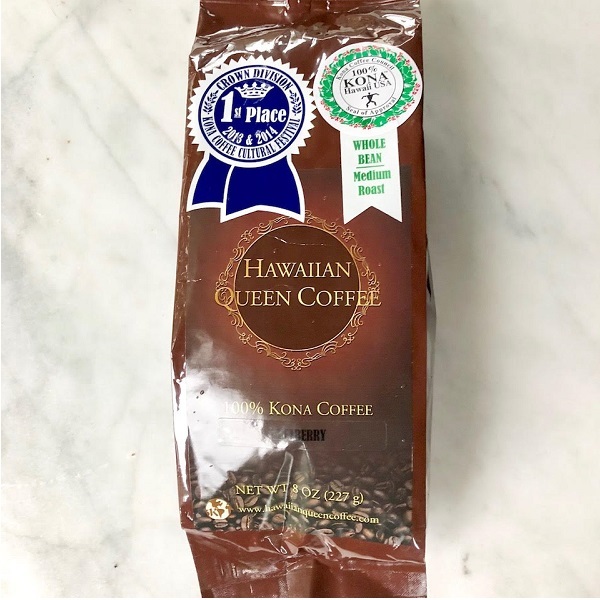 This is a special coffee from Hawaiian Queen Coffee, who is both the farmer & the roaster of the coffee. A quick crash course on Kona Coffee – it’s only grown in a certain designated area of the Big Island of Hawaii. Sometimes Kona is blended with other coffees, and labeled as Kona, however this is 100% Kona Coffee. Very few people have actually had 100% Kona Coffee. Kona coffees are among the most expensive in the world, and are renown for their smooth taste. The coffees are grown on the volcanic soils of Hawaii, and typically roasted at the farm, which is unique in the coffee world. This is a Peaberry Kona – What is Peaberry Kona Coffee? It’s an extremely rare coffee, with Peaberry Kona representing only 5% of the Kona Harvest. A Peaberry coffee bean is a bean that doesn’t break into two halves, it’s a naturally occurring mutation where the bean grows around two-thirds full. The beans are pulled from the regular harvest, because their smaller size packs more flavor. This coffee costs $30 for an 8oz bag and a 1lb bag goes for $56, which might make a great gift for one of your coffee loving friends. As an espresso it was creamy and smooth, but finished with a darker flavor. A very unique flavor, and we’ll say each shot we pulled had a slightly different feel. This would be considered the coffee drinker’s coffee, it’s smooth and flavorful with the classic full flavor of a great coffee. It had a nice balance of acidity some chocolate, and again a really rich feel.This is also the first coffee we’ve ever reviewed that was grown in the USA. Special thanks to the team from Hawaiian Queen Coffee for the coffee, visit them at HawaiianQueenCoffee.com. As don’t forget to check out our updated list of the top coffees of 2018.